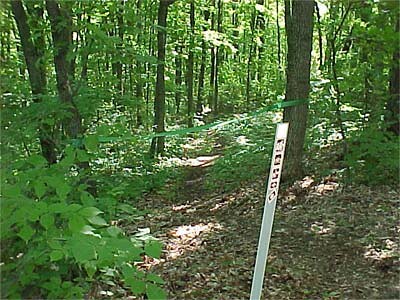 This trail, in the heart of Daniel Boone country, is 7.4 miles of 100% singletrack designed for hike and bike use only. Weaving up and down several times in a large hollow, it is a constant challenge to novice and advanced riders alike. This is some unique terrain, heavily wooded, very dark and shady, with several rock-bottom creek crossings. Due to the steepness of the terrain, the area wasn't logged so it presents an uncommon setting with low volume mid-level growth, and tall old-growth trees forming a high, dark canopy. It almost has the feel of a natural amphitheater. The trail surface is mostly dirt, with several veins of rock, and rocky creek crossings/waterfalls. Stop and look around when you reach the bottom of the valley. The trail should be ridden both clockwise and counter-clockwise; each offers its own pleasures. From the Highway 40/94 interchange: Take Highway 94 South approximately 13 miles. Go past Defiance to Matson, turn right and follow Matson Hill Rd. to the top of the hill. Turn right onto Matson Road (now paved) and go ½ mile. The trailhead is on the left side of Matson Road. It is well signed from Hwy 94 to the trailhead. You can also park down at the Katy Trail parking lot in Defiance, and ride up a very steep Matson Hill Rd. to add 2 miles each way to your ride. Located in Southwestern St. Charles County Matson Hill Park is a 68.5-acre park. 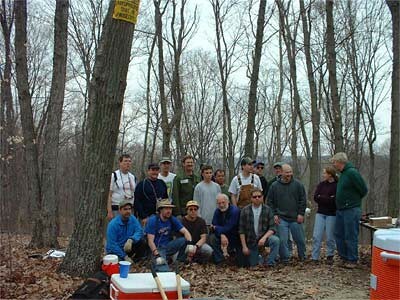 Acquired by the County in 1975, this park's topography is rugged wooded hills with intermittent draws or valleys. Located within the Daniel Boone Historic District, the park is reminiscent of the area during Boone's life. In fact, it is possible that Daniel Boone walked within the park's boundaries during some of his many journeys. This park provides a unique recreational opportunity for nature lovers or those wanting to escape into a heavily forested landscape. 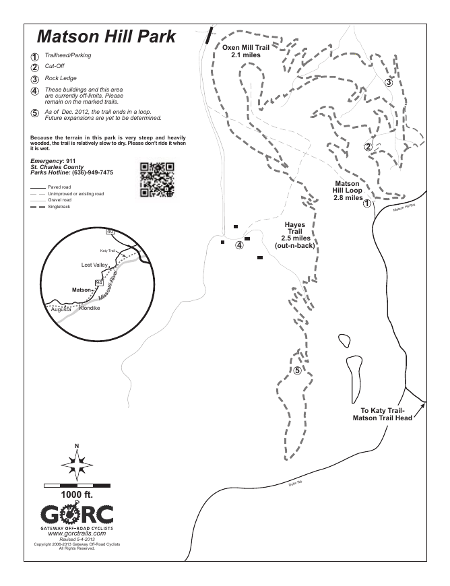 Matson Hill Park is the effort that got GORC started. 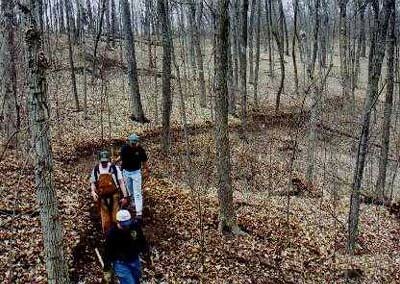 This is what brought the greater St. Louis area mountain bikers (St. Louis, St. Charles and Western Illinois) together as a group to create a new singletrack trail in St. Charles County. 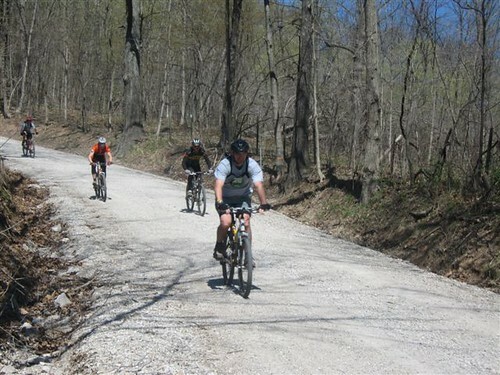 The St. Charles County Parks Dept has put many hours of effort into this trail and making it happen for mountain bikers. They deserve a great deal of thanks for this. They have been behind this effort 100%. Many thanks go out to our friends at Momentum Cycles for the materials to build the "bridges." 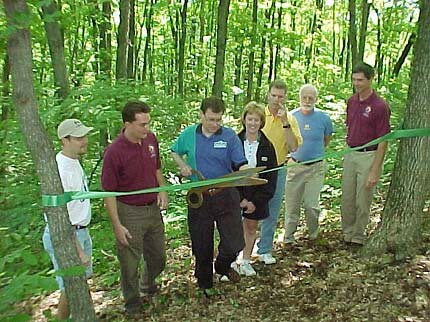 The trail was dedicated June 2nd, 2001. Nice and dry Fast! Have the park to myself! Come out and ride. The trail is open and mostly great. Still some wet spots down low. Stay left on matson hill Loop coming out of the parking lot. Right side has too many wet spots and ruts. There are at a dozen wildflowers blooming right now. Slow down and enjoy. Trail is OPEN and rideable but some low muddy sections that make for a slog or walk-around. Tires were loaded w mud. Still, it’s open and needs tires. Trail closed by Park Department . . . frozen footprints and snow make it unrideable. Went out there today, total mess, sank up to my ankles in mud, not even suitable for hiking.